A novel device to help kids see, efforts to enhance the potency of an antibiotic and a new decision-support tool that would significantly improve efficiencies in construction and other industries are three research projects currently under way at the University of Missouri–St. Louis. These projects also share in common the fact that the UMSL faculty behind them have won FastTrack Funding Awards, which are administered by the University of Missouri System Office of Research and Economic Development. The program provides up to $50,000 per proposal to support prospects from each of the UM campuses. The support allows recipients to focus on development, testing or prototype construction; and/or conduct specific market research to bring the technology closer to market. In the 2014 FastTrack round, all three applicants from UMSL received funding. Three projects from the University of Missouri–Kansas City and two projects from Missouri University of Science and Technology were also funded. The UMSL projects are described below. Inventors: Carl Bassi, associate professor of optometry at UMSL; Michael Howe, senior research engineering technician, College of Optometry at UMSL; and Wayne Garver, adjunct instructor of physics and astronomy at UMSL. Amblyopia is the loss of vision in an eye when the brain “suppresses” information from that eye and is the most common reason for vision impairment in children and young and middle-aged adults. If not detected early, it can cause permanent vision loss. The National Eye Institute estimates that 2 to 3 percent of all children have amblyopia worldwide. While amblyopia can be prevented or reversed if detected early enough, current technology on the market can detect visual suppression only qualitatively and only when significant suppression is already present. This novel, extremely sensitive device that quantifies visual suppression changes that with early detection and treatment tracking capabilities. 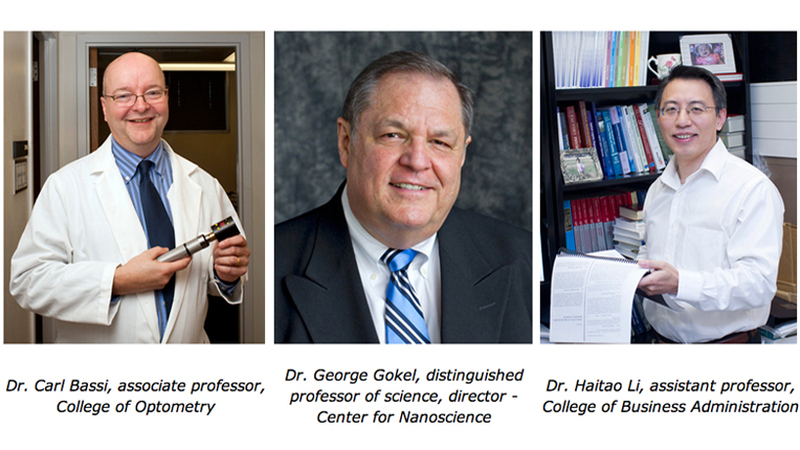 Inventors: George Gokel, Distinguished Professor of Science, director of the Center for Nanoscience at UMSL; Mohit Patel, UMSL biology graduate student; Saeedeh Negin, post-doctoral fellow, Center for Nanoscience at UMSL; and Michael Gokel, technician in the Center for Nanoscience at UMSL. Dangerous antibiotic-resistant bacteria have now emerged in every part of the world and threaten to roll back a century of medical advances, according to the World Health Organization. Infectious organisms have adapted to the antibiotics designed to kill them. There is now resistance to more than 50 percent of known antimicrobials discovered. This discovery, new methods to enhance the antimicrobial activity of an antibiotic, will help address this critical issue. The technology has numerous potential applications: anti-microbial, anti-fungal and anti-cancer. FastTrack funding will help optimize the finding and help position it for clinical trials and commercial partnerships. Inventors: Haitao Li, assistant professor of logistics and operations management at UMSL; Ceki Halmen, associate professor of civil engineering at UMKC; and Liu (Dorothy) Yang, UMSL graduate student in logistics & operations management. This project focuses on developing a decision-support tool for optimizing the resource allocation and scheduling of construction projects, helping to solve real-world problems in resource management, supply chain design and logistics to keep costs low and projects on time. The tool will offer decision-support capability and functionality that is not available in the current commercial project management software. While work will initially focus on the construction industry, the technology has application in many other fields including pharmaceutical chemistry, military, professional services, manufacturing, etc. Prior work has been funded by Hewlett Packard and the Army Research Office, along with a University of Missouri Interdisciplinary Intercampus grant. FastTrack funds will focus on the commercial advancement of the construction-focused work completed under the IDIC award. Tamara Wilgers is director of technology commercialization and economic development within the Office of Research Administration at UMSL, and Abby Schulte is an executive staff assistant in the Office of Research Administration at UMSL.